I’m not sure whether or not Saints James and John, at that moment when Christ asked them if they were willing to drink from the same cup He would drink of, fully understood their own acquiescence. They knew Christ was the Messiah, but the Apostles were still in disbelief that the Messiah would have to suffer and die. I think they were still clinging to the long-held belief that the Savior would be a military leader and victory would be seen over their enemies. Maybe they didn’t think all that bad stuff was really going to happen. Maybe they banked on a miracle happening and that Jesus would not have to suffer so much. But their quick response does tell us that they wanted to be part of the Kingdom. They wanted to do God’s work. They were asking to do His will. And this readiness is something I ponder and question in my own heart often. I pray to do God’s will. And I mean it, I really want His will done in my life. But I also know that often when I pray that His will be done I am praying that His will lines up with what I want. Now, Saint James and Saint John were Apostles. Saint James would go on to be martyred for sharing the faith, Saint John to care for Our Lady and write a book of the Gospels—they were men of incredible faith who did incredible things. 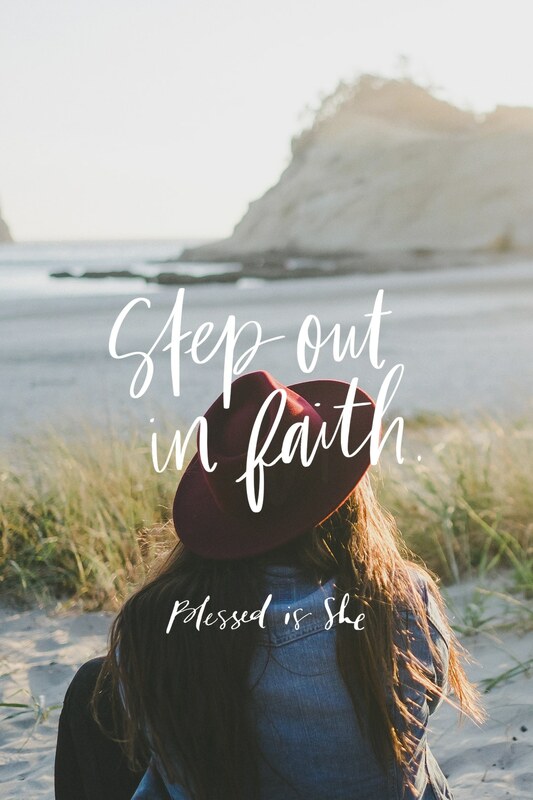 In the spiritual life this half-way acceptance, this stepping out in faith is very real. We often cannot accept the suffering and pain in our lives ahead of time. We don’t want the pain. Even when we’re living through it and offering it up, we aren’t loving the experience. Even though Jesus just spoke of mocking, scourging, crucifixion and death, I don’t think Saint James’ and Saint John’s imaginations could fully comprehend what was in store. Our imaginations can’t comprehend what God has in store for our lives either—the blessings or the sufferings. But we can still choose to respond with an eager, burning yes, and step out in faith. Respond with an eager, burning yes, and step out in faith. Lord, we pray for Your will to be done in our lives. We pray for the courage, the grace, the faith needed for what You have in store for us at the time we need it. Saints James and John, pray for us that we may grow as close to Christ as you were. This is a beautiful reflection… Thank you! This is so helpful to me. I really struggle with the idea of mortification or even of suffering. I know we can not escape it, but I really do not wish for it, for myself and even less for those I love. I so appreciate your thoughts on this and that we can say a half-way yes not knowing what is coming. That that can still mean that we truly wish to step out in faith and follow. I believe that James and John did not know what they were going to face exactly; they were warned of the consequences, but they stepped out courageously anyway. I am facing that fear right now — the fear of whether this is God’s will, and even if it is, not knowing what is coming has stopped me from stepping out. I’m praying for a faith like James and John. Thank you for the inspiring reflection.